Both are typically comprised of organic materials and both are beneficial for gardens. 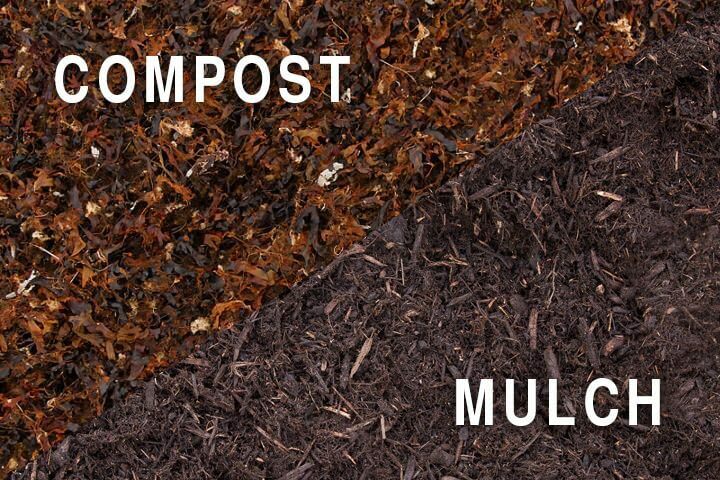 They can even accomplish the same thing but the primary difference is that compost is added to gardens to supply nutrients to the soil while mulch is used to protect and shelter the plants. Compost at its most basic description is organic ingredients that are breaking down or decomposing. The process creates a natural amendment that is rich in minerals and when added to the soil provides valuable micro-organisms. Compost improves the quality of the soil and can also improve the texture making a more hospitable environment. Mulch is a product that is added to the top of the soil around the base of the plant to hold in moisture, discourage weeds and help regulate the temperature of the soil. It too is made of organic material but is not typically decomposing. Making your own compost is an easy and rewarding project but one that requires patience because the process of decomposing can take months. Get started by selecting a site. You can create a compost pile in a corner of your garden and the size should be about 3x3x3 feet. Or you can use a bin. Whichever method you chose just keep in mind that compost needs to be turned over regularly so choose a method that will work well for you. Once you’ve readied your location, now you begin to add material. You can use kitchen waste (vegetable peels, coffee grounds, egg shells), shredded newspapers, lawn clippings, leaves and other vegetation that would otherwise get thrown away. It can be very satisfying to put waste matter to good use. The biggest tip is to remember what you should NOT use: any animal product or pet droppings, bones, dairy or synthetic chemicals. To keep the decomposing materials “cooking” they need to have air circulating through the pile that’s why you need to turn over the matter or a regular basis. The aeration speeds up the composting process. If you don’t want this labor, consider buying a rotating bin. Shred or chop materials before adding to compost so they will break down faster. You can buy a composter starter that contains lots of nitrogen to get the cooking process fired up. Keep a covered pot in your kitchen to collect scraps to decrease the number of trips you make to the pile. Big additions to the pile (rather than small amounts) will encourage the decomposing matter to heat up. Make sure your pile gets lots of sun. Don’t forget to keep turning the pile to bring in more oxygen. Your compost will be ready when all materials are so broken down that you don’t recognize anything you added to the pile. The matter will look like rich, dark soil; it should smell slightly sweet and earthy. Work finished compost into your garden around 2-4 weeks before you begin to plant. While it’s easy to buy bagged mulch from a garden center, know that it can also be purchased from a professional landscape company in bulk. When ordering a large quantity – or truckload – you can choose the type of mulch. A visit to the supplier will give you the opportunity to determine the look and texture you prefer. Keep in mind that mulching also has aesthetic appeal so a double ground or triple ground dark mulch will look more natural in your garden or flower bed. Before applying mulch, clean the bed to remove debris and weeds. A rule of thumb is to apply mulch about two inches deep. The goal is maximum insulation without encouraging over saturated soil. Choose a product that is easy to work with and won’t erode. Heavy, thick shreds are hard to spread evenly and really fine mulch can blow away. Never pile the mulch up around the tree trunk or plant stems. Doing so promotes rot and pest infestation. Additionally don’t build up the mulch around the sides of your home because it will hold moisture against the foundation. If you yard becomes covered in leaves in the fall you can mow over them to create mulching material. Just be sure the leaves are finely shredded. Ideally mulching should be done twice a year – fall and late spring. Compost and mulch are very beneficial for successful gardening and landscaping. Hopefully these secrets and tips will help you use both to full advantage.